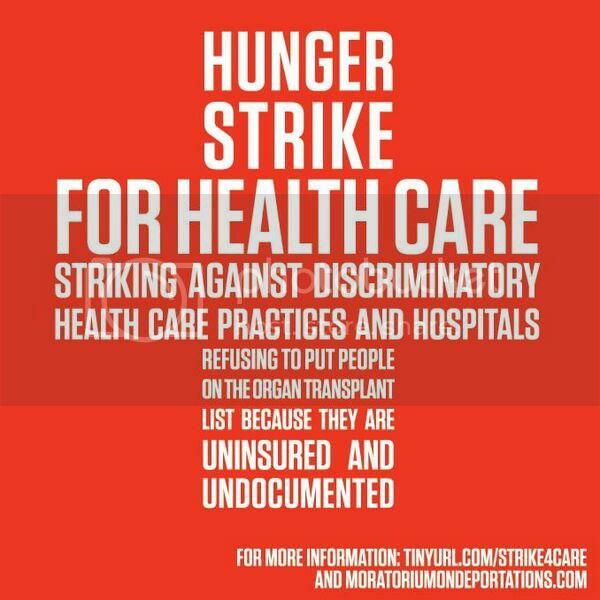 A group of hunger strikers is demanding access to organ transplants to save the lives of undocumented immigrants. 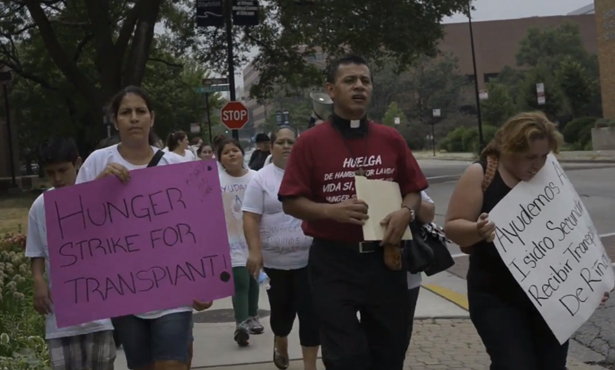 A group of about forty picketers, including fourteen people who were on their sixth day of a hunger strike, set up camp outside Northwestern Memorial Hospital on Sunday to demand access to organ transplant procedures for undocumented immigrants. Gomez told the Sun Times she has lost four pounds and was surviving on water and Gatorade. The group said fourteen undocumented Mexican immigrants who live in the Chicago area need either a liver or kidney transplant, but they can’t afford one because they are denied federal health care because they’re not citizens. Asnell also points out that many organs come from uninsured people, but other uninsured individuals rarely receive organ transplants. The hunger strikers see this system as immoral and unjust. Observers of the protest tweeted updates under the hashtag #LVhungerstrike and reported that hunger strikers and supporters plan to enter Northwestern Hospital this morning to deliver a letter. The group also encouraged supporters to call Northwestern and leave a voice mail for CEO Dean Harrison to ask him to meet with hunger strikers on Monday. Protesters have been trying to meet with hospital representatives, but have thus far been rejected. “The response of the hospital was very cruel and insulting,” stated Father Jose Landaverde, one of the hunger strikers. “I was told that if we try to leave a letter for the hospital CEO, they will just throw it in the garbage. By denying care, and even refusing to speak with undocumented patients, the administration are responsible for the death of many people in our community” added Landaverde. “I am becoming very weak, and the aggressive attitude of Northwestern Memorial Hospital administration was shocking,” said Gomez. “But our determination is stronger than ever to continue the hunger strike,” she added. In Chicago, teachers are continuing to fight back against Rahm Emanuel’s austerity agenda.